Editor's Note: This story was published in the early part of 2010 and received little attention until just recently. It's very satisfying as a writer to receive emails from readers who are finally realizing what kind of deception has been pulled on the American citizens. I also thank Rense.com for posting the link. For some reason, Rense.com rarely carries stories from viewzone.com, despite our common concerns and views. Anyway, thanks Rense! And thanks to the many readers who help spread the truth from websites like rense.com and viewzone.com -- we do it for you because we love this country and despise what it has become of late. Happy July 4th everyone! More Gulf War Veterans have died than Vietnam Veterans. This probably is news to you. But the truth has been hidden by a technicality. So here is the truth. The casualties in the Vietnam War were pretty simple to understand. 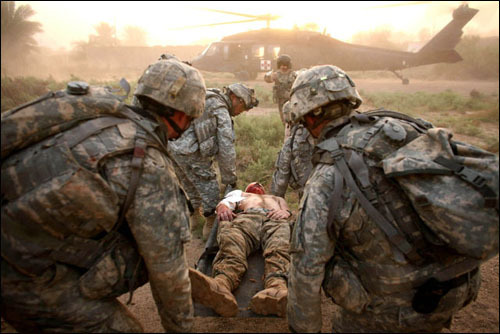 If a soldier was dead from his combat tour, he was a war casualty. 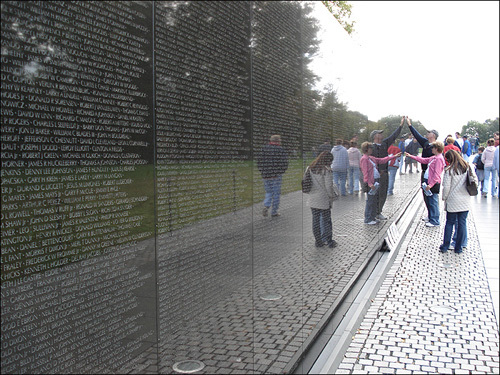 There are 58,195 names recorded on the Vietnam War Memorial in Washington, DC. Some of these brave men died in the jungles of Vietnam while others died in Medivac units or hospitals in Japan and America. A dead soldier can surrender his life anywhere in service to his country. It really doesn't matter where this happens. The location of a soldier's death in no way colors his sacrifice. But something odd has happened with the Iraq War. The government, under the Bush administration, did something dishonest that resulted in a lie that's persisted since the war began -- and continues to this very day. They decided to report the war deaths in Iraq only if the soldier died with his boots on the ground in a combat situation. What's the difference, you might ask? The combat in Vietnam was in rural areas, far removed from medical treatment centers. Injured soldiers were treated by a Medic. Most died at the scene of the battle before they could be evacuated. Many died on route or were declared dead at the medical treatment facilities. The situation in Iraq is vastly different. Fighting in Iraq is mainly in urban areas. Soldiers who are injured are quickly evacuated with armored personnel carriers or helicopters. It's a much more efficient system than what was possible in Vietnam, but for those that are seriously injured it means that death is more likely to happen while they are in transit or at the treatment facility. Under the new reporting system, deaths that happen en route or post evacuation are not counted as combat deaths. This is why the number seems unusually low -- a little over four thousand as of 2009. The actual figures have been hidden from the American public just like the returning, flag draped coffins were censored from the press. But the figures are now available and we can only hope that the American people will be outraged when they learn how they have been misled. More than 1,820 tons of radioactive nuclear waste (i.e. depleted uranium) were exploded in Iraq alone in the form of armor piercing rounds and bunker busters. This represents the worlds worst man made ecological disaster ever. 64 kg of uranium were used in the Hiroshima bomb. The U.S. Iraq Nuclear Holocaust represents far more than fourteen thousand Hiroshima's. The nuclear waste the U.S. has exploded in the Middle East will continue killing for hundreds of years! That's how long these particles of radioactive dust will continue to blow around, get lodged in someone's lungs or be ingested. Scientists calculate that there is now enough radioactive material in Iraq to wipe out a third of the world's current population. While we never found any WMD's (Weapons of Mass Destruction) in Iraq, we sure made up for it by importing our own! Birth defects among Iraqi newborns are up a whopping 600% from before the war. The defects are typical of the kind produced by exposure to radioactive poisons. And these injuries are happening to the civilian population of Iraq -- the people we were supposedly "liberating." This writer happened to visit Iraq back in 2001, at the time Saddam Hussein was still in power. The world's nations were imposing an embargo on all imports in an attempt to punish the nation for invading the neighboring nation of Kuwait. I remember the good people of Iraq who treated me with kindness and hospitality -- even while knowing I was an American. Despite the embargo on such vital things as medicine and hospital supplies, the markets were thriving with local produce. Children freely played in the streets and there was laughter. To see what this war has done to Iraq is especially painful and speaks loudly of the immorality that has caused these innocent people to suffer. And now, to see that this same immorality extends to the American people in the form of deception and lies crosses the line. I live in a small town in New England. We have known of many casualties from Iraq -- too many. Yet the numbers being reported in the media make it seem that this is a rare occurrence. Just over 4,000? How can this be? In short -- it's NOT. What will it take to awaken people and make them angry enough to hold our government responsible for these lies? A democracy is only good if its people are well informed. How else can we make decisions abou what's best for us? If we are fed s*** and kept in the dark we truly are a nation of mushrooms. Before I end this I want to say a big THANK YOU to all the vets who put their country and its people before themselves. We are proud of you and believe that you put your lives on the line for something a little better than what we are currently experiencing with our government. Thanks to you we're still a democracy. So it's up to us, the people you fought for, to make your effort worthwhile. What do you think about this? Do you care? What goes around, comes around. "As ye sow, so shall ye reap." Amerika is being well rewarded for its profligate use of DU. The massive plumes of radiation from the Gulf of Mexico and Fukushima will rather nicely even the score in the next fifty years. Didn't know about the radiation in the gulf did you? The establishment, if it addresses the subject at all, is passing off the classic radiation symptoms in the gulf as being caused by corexit and petroleum. WRONG! The ongoing gushers are blowing 40% methane petroleum which contains five times as much thorium, uranium and other radioactive substances which run in parallel with increased methane content. Normal petroleum is 8% methane. Kudos Gary and well done Viewzone. Including the number of contractor gunslingers KIA and WIA would add substantially to the tragic losses in America's longest war. Contractor casualties go unpublished in the numbers game. All I got to say is George Orwell was right, and for that matter so was Timothy McVeigh. That, and a friendly reminder that the nice thing about tar and feathers is how well they ignite. Sorry to say that this is just good news to me. I have no regard for any of the invading soldiers, how can I? The more that die, the better, the sooner they might be called home since selfish interests are all that seem to drive the American people to hold their leaders to account. At least it might save more innocent Iraqi and Afghan and Pakistani and Libyan and Iranian and Somali and how many more countries do your "brave soldiers" trash at this time? No I am sorry to say even as an Australian I care not for our own, let them die if they would engage in murder of innocents. Ignorance is no excuse. You are fighting in a country which did not attack you, how stupid does a soldier have to be to not realise he is engaged in a war of aggression then? You are correct, the methodology for creating the undercount has been known about or occasionally commented on for some time. Your report is the first time that I have ever seen presenting a number based on official stats though. Staggering. I write to tell you that even this count of dead is short. As it counts only US Military dead, it leaves uncounted all the mercenaries fighting in this kinetic action, aka, war. And didn’t this start out as some variant of the coalition of the willing, what about their losses. This is brought up not to downplay your efforts, which are appreciated, but to show that there has never been any count of the total cost in lives of this or other recent wars. That pattern of deceit, of lies, needs to be highlighted too. Absent in all discussions is a reliable count of enemy dead. The racism, the wrong headedness of that is incredible. By not counting their dead, we are saying you are sub-human, at the least you are not worthy of being counted. That and the fact that they don’t want the US population to know how many people have been murdered. As for the DU, there is enough of it in the air now to have reached even the US. Between that and Fukushima, we are in trouble – some might say reaping what we have sown. Good work you have done. Please find ways to spread this into the MSM. Please find some way to get this more widely known. It is important and may change the national conversation. Perhaps email it to local newspapers and radio shows, the wire services, selected congressmen, local town politicians. the corporations are taking charge of the government but there are still many more of us than them, and we are waking up continue to wake people up, do not give up- we can have just as much determination to return to a democracy as they have to take it away from us speaking truth about power is the best thing you can do and spread it around if consciousness is a virus- let's spread it around! Nothing gets solved in Iraq or anywhere elsewhere until you begin to identify the Jewish role in all this perfidious and pathological mayhem. If you don't have the balls to do that, then you're part of the problem. Thus far, beautiful website though you might have (one which I read frequently), I haven't seen you do that. O what to do-I told the guys I hang out with at the coffee shop, with not a one believed me they all like bush and I may as well been talking to the wall, it hurts me so much to see my fellow human so brain washed, what to do? I am a vet from the middle 60 and have seen it all and I am completely fed up with this, no matter obama bush it is the same lies the news media is a shame , what to do? O WHAT TO DO? US ARMY SP5 WILLIAM L. DAVIDSON RA 1567???? Wow. I never know that's what they were doing. I'm ripped. What can we do? Obama hasn't prosecuted these people and is rubber stamping everything that Bush did. Is it hopeless? I really think it is. The United States Government and the so called 'Human Beings' that are in charge of this Corporation are an embarrassment to humanity. Thank you for coming out with these numbers, Gary. To not to be truthful about them is certainly a diabolical crime in itself. Surely, lessons are still not being learnt by the American public -- which send their sons and daughters to war -- generation through generation. It seems the nation itself is in some sort of dogmatic slumber as to why war must be a way of life for the nation -- never ending. At the same time, the people must find an alternative to War itself on the Planet -- for some of the obvious reasons you have pointed out in your article. and, as to the war death of the "other" side, 5 million orphans in Iraq (forget Afghanistan) have been created alone -- does that tell you how many people they killed in Iraq when it was invaded? War must simply be outlawed as a crime on the Planet, and the perpetrators (politicians and media folk) must be dealt with accordingly (preferably from the highest lamp post). Epilogue: OK. Maybe it's because of the 4th of July or something but I am really moved by the response that I have received from this story. As a writer and researcher, I am exposed to the "truth" so much that it often gets me depressed. Facts such as these are seldom reported and so the deception of our government continues unabated. It sometimes makes journalists feel contempt for the public who seem to allow atrocities like war, greed and injustice to thrive. But in the past few days, again thanks to the link being posted on rense.com, I've received so many e-mails asking "What can we do about this?" It's encouraging, to say the least. So I will post this little comment here and ask the question, "What can we do about this?" Not just the fudging of the Iraq war deaths -- that's just a symptom of a greater ill that has taken over the world. What about the greed and selfishness that is the root cause of these ills? What can we do? Viewzone is just a small website. But if a story like this can raise concern among good hearted people, perhaps there is hope. I used to show visual images of the horrors of war. But the advertisers on viewzone won't allow this anymore. The site has to be "family friendly". For several months last year I was shut down because of images I posted of the Gaza Holocaust. But perhaps you read this and feel the urge to make changes to the world. If you do, please write and give me your suggestions. All big changes start with a small idea. How can we combat this evil? Let's talk. Anyway... thanks for your support.